The Washington Army National Guard’s 81st Brigade Combat Team will be coming home this month, after relinquishing command of its operations in Balad, Iraq. 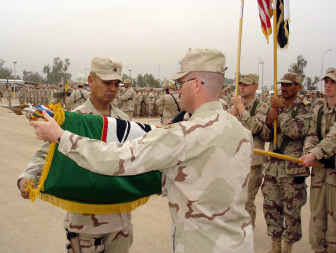 The brigade, which oversaw security and stability in the region from its base at Logistics Support Area Anaconda since April 2004, turned over its authority Thursday to the 29th Brigade Combat Team from Hawaii during a ceremony at the base, about 50 miles north of Baghdad, according to a brigade news release. The brigade is expected to return to Fort Lewis near Tacoma by the end of the month. The deployment, which included approximately 3,200 Washington Army National Guard soldiers, was the largest activation of guardsmen and women from Washington since World War II. Nine soldiers from the brigade were killed in Iraq, and many others were wounded. During its deployment, the 81st Brigade had an infantry battalion in Baghdad’s “Green Zone,” an artillery battalion in Kuwait and Saudi Arabia, a cavalry unit in Kuwait, an air defense artillery unit at Baghdad International Airport, two armor battalions providing security around Baghdad and an engineering battalion dispersed to several other locations, according to GlobalSecurity.org, which keeps track of U.S. military abroad. LSA Anaconda was home to the brigade’s headquarters company, many of whom are from the Spokane area, as well as the 181st Support Battalion, and task forces Tacoma, Rainier and Chinook. According to the release, the brigade performed thousands of combat and humanitarian operations and participated in both the transfer of authority to the provisional Iraqi government in June 2004 and the Iraqi elections on Jan. 30.